There have been rumors about this coming for a while now. Oregon just completed a highly disappointing season that resulted in a 4-8 record, which makes for their first losing record since 2004. 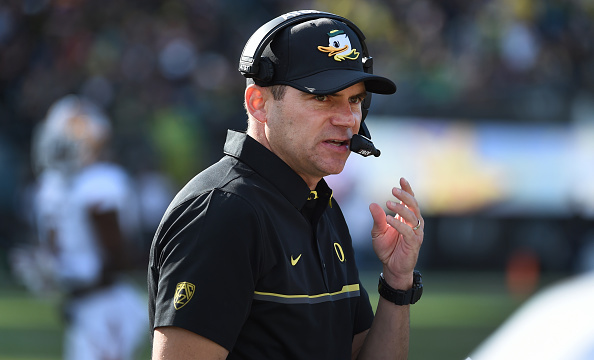 The Ducks had an overall record of 37-16 in Helfrich’s four years as head coach, but this is a program with extremely high standards after their dominance in the Chip Kelly era. It’s also worth wondering how much of the success Oregon had in 2013 and 2014 under Helfrich was actually due to his own work, or if it was mainly because of where Kelly left the program. The general thinking is it’s hard to really get a good feel on a college head coach until years three and four, after they’ve had time to get their own recruits and see the those players develop. Well, the Ducks went from being in the National Championship Game in year two of Helfrich’s tenure, to 9-4 (with an Alamo Bowl loss) in year three, and then of course the 4-8 record this season. It was reported earlier this month that Oregon alum and Nike co-founder Phil Knight is willing to pay $10 million a year to get a new head coach. We even shared a report today on Florida head coach Jim McElwain being considered a candidate for the Oregon job. Florida to Oregon is basically a lateral move in terms of the football programs, but McElwain is making “only” $4.25 million annually at Florida (still the highest annual salary in the SEC East), so if those rumors on what Knight is willing to pay are true, the Ducks may be able to present McElwain with an offer he can’t refuse. USA Today’s Dan Wolken recently reported that Western Michigan’s P.J. Fleck, Boise State’s Bryan Harsin, Penn State’s James Franklin, and North Carolina’s Larry Fedora could be candidates for the Oregon job. Oh, and you’d better believe we will hear a lot about Chip Kelly — currently the San Francisco 49ers’ head coach — as a possibility to return to Oregon.